If you have been discharged from a hospital after an illness, surgery, or an extended stay and require a higher level of care to regain strength and restore your health, a skilled nursing and rehabilitation facility is an ideal choice. Along with recovery services, they provide transitional care assistance as well, aiding in recuperation. Rehabilitation facilities offer a variety of supports that are beneficial in making a successful recovery. Providing Medical Follow-Up: They have skilled and qualified staff members to look after their patients round-the-clock and provide adequate follow-ups and check-ups after their hospital stay. The transitional care services that they offer will ensure a quick, smooth recovery and can make the difference between a successful return home and a rebound to the hospital. Continuous Care to Help You Recover Quickly: Due to cost, space and other factors, sometimes patients are discharged from hospitals prematurely, which may hinder their recovery and send them back to the hospital. 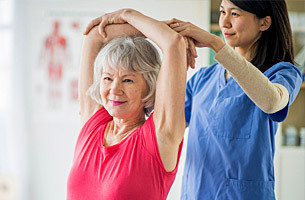 A skilled nursing and rehabilitation facility will provide them with the much-needed care and monitoring, physical therapy, pain management, and nutritional guidance. It will also help prevent minor problems from escalating. Help Become Independent: Besides helping you recover from your injuries, the skilled nursing staff will help you regain confidence to get back to your regular life without making you too dependent on their transitional care services. They will also prevent you from hurting yourself again or reopening wounds. Engage the Patient & Family in the Healing Process: The professionals at a rehab facility confer and engage the patient and their family in the healing process, keeping them updated on the medical status of the patient. They also discuss the challenges the patient faces, take steps to understand them, and incorporate measures accordingly in their care plan and routine. At The Holiday Skilled Nursing and Rehabilitation Center in Manville, Rhode Island, we have a dedicated professional in-house team of therapists and nursing staff to provide our patients with the best care possible. Besides providing them medical care, we offer a sense of security as well as several amenities for a comfortable stay in our center to help individuals recover quickly. For more information on the services and facilities at our skilled nursing and rehab facility, you may reach out to us by calling at 401-765-1440. If you’d like to schedule a tour, please fill out the online form. Also Read: Why is a skilled nursing facility Community a Good Idea?